Celebrating our Bicentennial in 2016! Henrietta United Church of Christ came into being soon after New York State was established, and before Rochester became a settlement. In 1811, the Rev. Solomon Allen, pastor of the Pittsford Presbyterian Church, preached a missionary sermon to his church. At this meeting, a collection of $10 was taken “to send the gospel to the Heathens.” Rev. Allen was asked to preach a service to “the destitute people of West Town” (Henrietta), and keep the money for his services. This he did and his efforts were followed by other religious services led by occasional speakers. As early as 1812, Deacon Moses Sperry read sermons to a small congregation in the school house near his home on the corner of West Henrietta Road and Lehigh Station Road. These sermons were sent to him by his former pastor in Connecticut – not an easy feat in those days before the Erie Canal was built. Records show the organization of the Congregational Church in Henrietta by Rev. John Bliss and Rev. Comfort Williams on May 20, 1816. In February, 1818, 51 inhabitants met for the purpose of officially organizing under the name “Manville Religious Society.” In October of 1818, members convened for the purpose of building a log meeting house for the Congregational Church and Society in Henrietta. 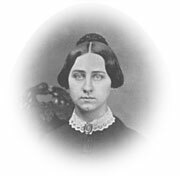 Antoinette Brown Blackwell, American minister and reformer, was born in Henrietta on May 20, 1825, and began to speak publicly in the services of the Congregational Church at age nine, and became a school teacher at age 15. She became a well-known speaker on behalf of women’s suffrage, the abolition of slavery, and temperance, and authored numberous books. In September, 1853, Antoinette Brown Blackwell became the first ordained woman minister in the United States. Property was purchased from the Monroe Academy for $250 in 1831, and by 1832 a brick church building was erected on Lehigh Station Road and East Henrietta Rd. The “Union Advertiser of Rochester” reported that a fire on the evening of January 26, 1867, completely destroyed the Congregational Church in Henrietta. Within three days an invitation was received to share the house of worship with the congregation of the Methodist Episcopal Church. Immediate plans were made to build a new church (pictured here). The cornerstone was laid August, 1867. At the same time the name was formally changed to the First Congregational Church of Henrietta. In 1916, the First Congregational Church and the Methodist Episcopal Church merged and became known as the Union Congregational Church. 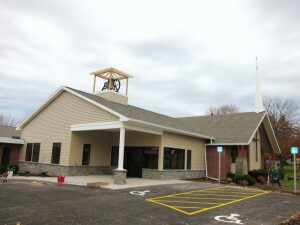 The name remained unchanged until February 2, 1959, when members voted to become the Henrietta United Church of Christ, joining the United Church of Christ denomination that was formed in 1957, when the Evangelical and Reformed Church merged with the Congregational Christian Churches. 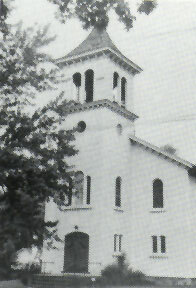 With the rapid growth of Henrietta in the early 1960’s, the church outgrew its facilities. Construction on the current site was begun in 1965 with the dedication May, 1966. In 1983, we ordained and called our first female pastor, the Rev. Glenda Prins. Our current Senior Pastor, the Rev. David Inglis, was called to our church in 1991. Our expanded building allowed for our ministries to expand. Our church established and operated a child care facility from 1978-1999. We established a ministry to the developmentally disabled. And we began providing meeting space for numerous groups providing important services to the community. We currently host three daily Alcoholics Anonymous groups, a Friday Al-Anon group, Neutral Ground (which provides support for the “single again”), and a music program for young children and their parents. In 1996, the North Rush UCC closed its doors, and many of its remaining members were welcomed into our church family. In 2000, we received notice that a local woman named Abigail VanWagenen had died and bequeathed money to the North Rush UCC “or another Protestant organization that was fulfilling the mission of that church.” Our church received half of that bequest in 2001, which was set up as an endowment. Because of North Rush UCC’s historic commitment to youth, HUCC used the earnings to establish a part-time Youth Pastor position. Due to the rapid growth of our church, especially with children, the position was expanded into a part-time Associate Pastor position, filled by the Rev. Martha Koenig Stone since 2006. After a year-long study, in 2012 our church voted to officially become an “open and affirming congregation, welcoming sexual minorities into our life and fellowship. Continued growth of our congregation required more space. In 2013 we undertook a major expansion project to provide more classrooms and space for our vibrant music program, provide accessibility for those with walking difficulties, and greatly improve our energy efficiency. Our building earned an Energy Star rating, with a perfect score of 100/100 for actual energy use. Our church has continuously provided strong support and both clergy and lay leadership to our wider church, through NY Conference, Genesee Valley Association, Greater Rochester Community of Churches, Rush Henrietta Interfaith League, and Interracial Council of Henrietta and Rush. We have been a community leader in supporting the Rush-Henrietta Area Food Terminal, Friends In Service Here (FISH), the local CROP Walk, and Cameron Community Ministries, as well as supporting many other local and global ministries and missions. We take seriously our responsibility to be good stewards of God’s creation by reducing energy consumption and the use of throw-away items, recycling what we can, educating our congregation and community about environmental issues, and promoting the purchase of fair trade products. Our history has seen changes in our name, our building, our people, our community, and our ministries. But one thing has not changed–our church’s commitment to love and to serve God and God’s people with dedication, unity and joy. This commitment is leading us into a future that is full of hope and promise.